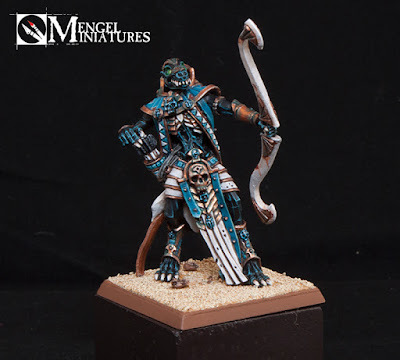 If there is any model that is iconic for the Tomb Kings besides the chariot, it's the Ushabti. They are just a plain cool model. 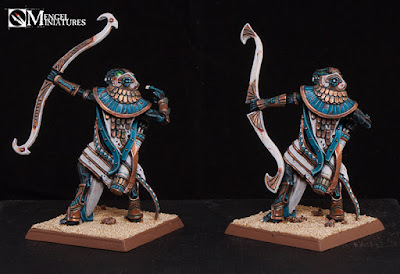 When 8th came out they got an upgrade with some Great Bows, which I decided to paint up first out of my nine (yeah, nine) Ushabti models I own. These guys are a little intimidating to start. They have so much detail on them, and it's mostly a bunch of detail that would be different colors. The "skin" was the easiest just because I was already so comfortable with this paint scheme. I painted it just like all of my other marble skin, which I have a tutorial for. The only difference was that I used the new version of Hawk Turquoise, Sotek Green. I did this mostly because I am running out of the old color and want to reserve it for my remaining characters now. 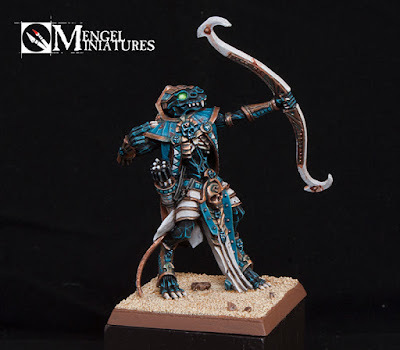 I also want to start transitioning my paint scheme to mostly new colors so I don't run into the problem of half my army looking one way, and the other half another. Luckily the two colors are pretty similar to each other and I can't really tell the difference. After the skin was done next up was the bone and cream marble. I wanted the ribcage to look like real bone, but the claws and teeth to loom more like a creamy marble. They are so small though that they mostly just ended up looking the same. If this had been a competition piece I would have pushed it harder to make them look different, but since this is just a centerpiece table top model I decided it was good enough. That's actually something that is a little hard once you start painting at a competitive level. 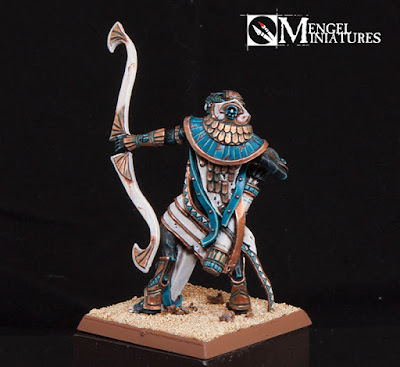 Obviously your rank and file guys aren't going to be top tier, but what about your bigger models like this guy, where do you draw the line? Eventually you have to decide if they are worth putting in as much time as a competition character or not. 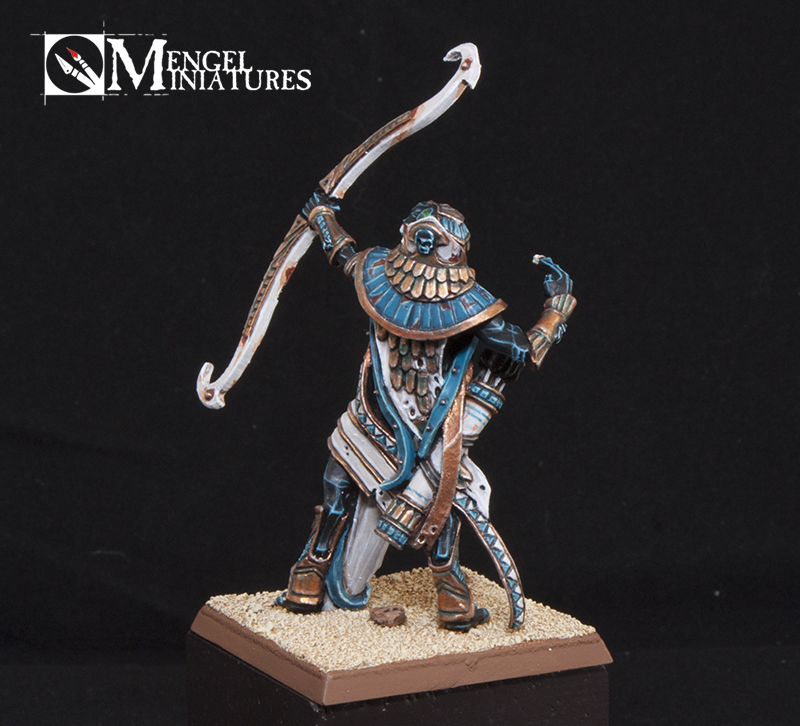 Since I have nine Ushabti to paint eventually I decided that these guys deserved high end table top and called it a day. After the bone was the the white, which went pretty quickly. Just a Rakarth Flesh/White mix shaded with Agrax Earthshade and highlighted with white. The gold was painted just like how I always do it. After these two colors were done I went back and weathered both of them with tears, dirt smears, and verdigris. This really helps give the Ushabti the look of ancient statues. For the turquoise I normally paint a layer of the darker color, in this case Stegadon Scale Green, followed by a layer of Sotek Green. I did follow these steps for the smaller areas, but on the collar and cloth straps I actually went in reverse. This was due to the surface area being so large. By painting the darker color into the recesses of the lighter one I saved myself a lot of clean up later. Even though there is a lot of detail, it's mostly made up of the stone, white, gold, and turquoise. Once I had wrapped all those up, all that was left were the gems and eyes. 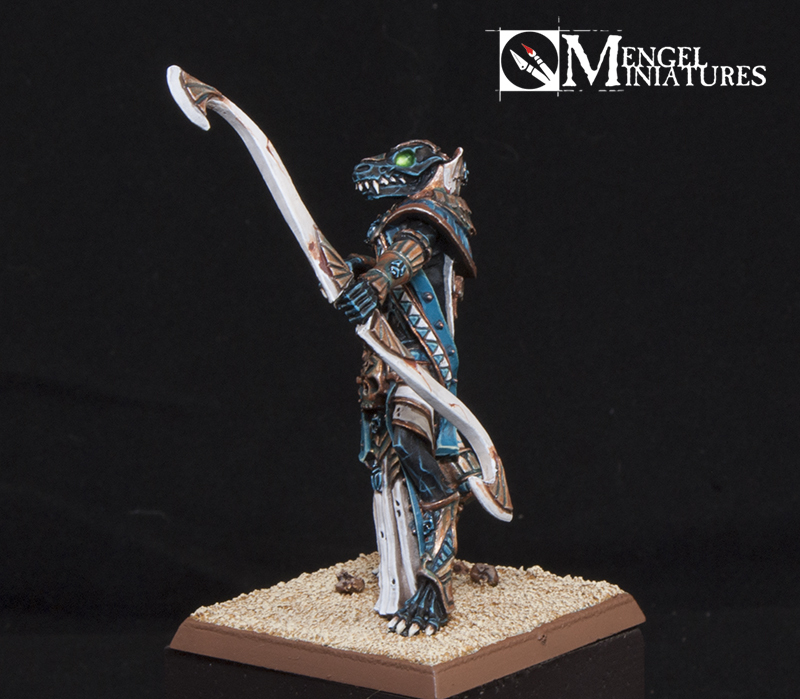 You can find a tutorial on how to paint the glowing eyes the way I do here. 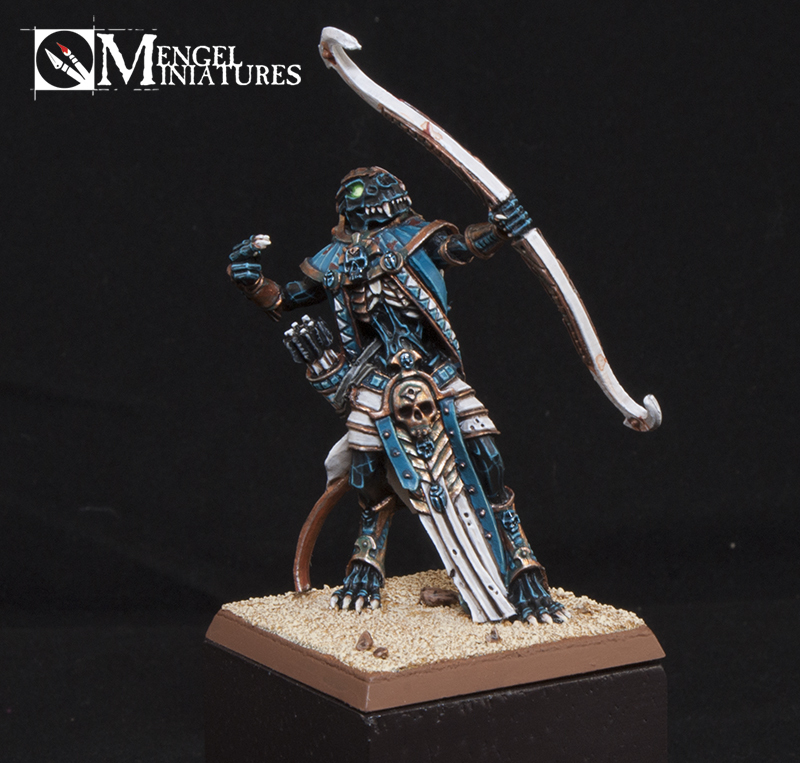 I am running perilously low on the colors for my basing for this army, which is troubling. The sand is basecoated with Tau Sept Ochre, while the rocks and rims on the base are Calthan Brown. Both of these are discontinued colors without a close color match, so I'm kind of at a loss for what to do. I will probably just look through eBay for another pot or two. These are the first two of a unit of six Great Bow Ushabti, and I also have three Great Weapon ones. With Age of Sigmar coming out I don't know how soon I will get to the rest of them. I have a Necrosphinx built and ready to go, as well as Apophas, a Necrotect, four Carrion and the Ushabti. 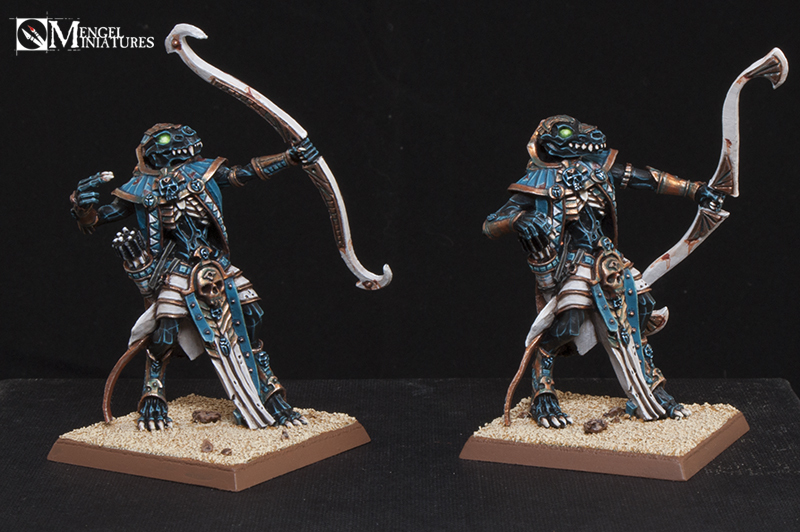 I also have several unbuilt chariots, some skeletons, a Warsphinx, another Tomb King, and Khalida. That's a lot, but I know some Stormcast Eternals are going to get in the way. 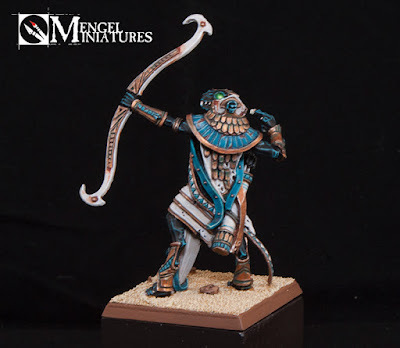 Next up for my Tomb Kings will probably be my Sphinx so I can get a big guy done, and maybe a handful more of my spearmen. 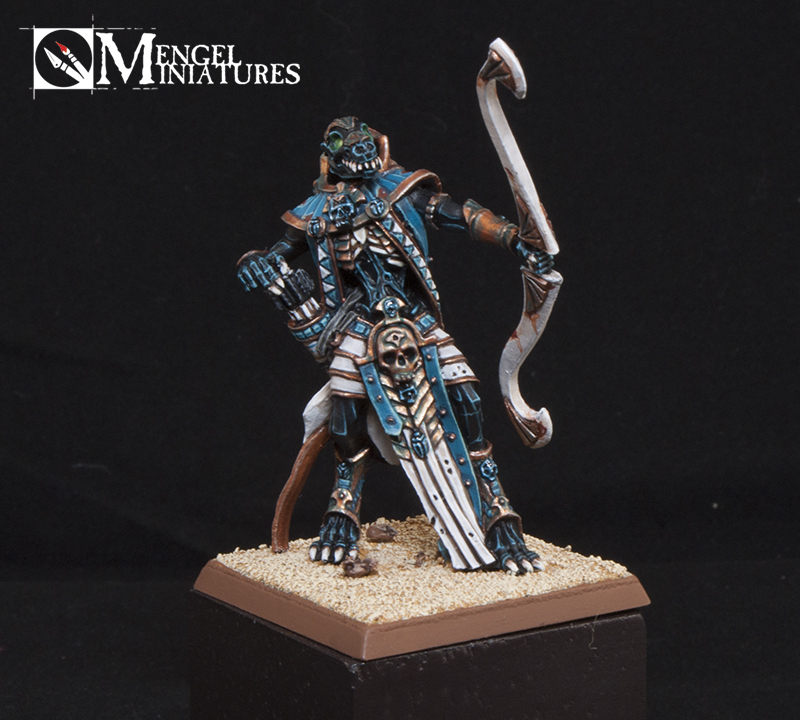 You can check out a 360 degree view of the Ushabti in the video below. The music is once again provided by Adam Harvey, you can follow him on his Facebook page and listen to some more of his music on his Youtube channel. Enjoy! 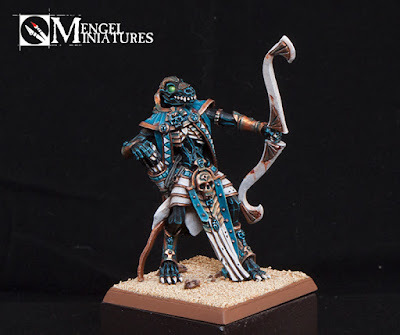 Be sure to vote for him on Cool Mini or Not here. Don't forget about the Age of Sigmar painting competition that is running right now. Check out the full details here. There are great prizes for every winner and you have until August 10th to submit your entry.